The Frederick Douglass Academy has been recognized as a NAMM Foundation Support Music Merit School. Harlem Samba is a Brazilian Percussion ensemble modeled after the samba school baterias of the Rio de Janeiro carnival. 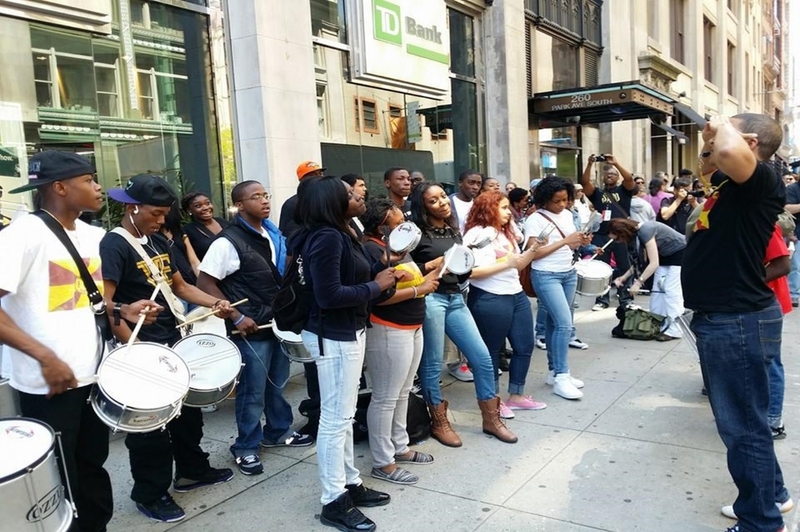 The group's members are students, alumni and friends of the Frederick Douglass Academy, a high performing public high school in Harlem, New York City. Harlem Samba is available to play all types of events. We have several performance options ranging from as small as six players to as many as 75. Stage shows including singers, cavaquinho and dancers are also available. Contact us for your next event. The program was founded in 2005 as a small after school program for students with interest in percussion. Since then it has grown to include to over 250 beginner students, each learning the basics of their chosen samba instrument while exploring the music of a new culture. The performing bateria is made up of 40 students in their second, third or fourth year of playing. This group swells to over seventy members from the school community for large parades and concerts. Alumni and other experienced NYC samba players are often invited to perform in the main bateria. Harlem Samba has performed at the Clinton Global Citizen Awards with the Roots, Brasilfest at South Street Seaport, Carnival with Alô Brasil at the World Cafe Live in Philadelphia, Winter's Eve at Lincoln Square,Red Hot and Rio 2 at the Brooklyn Academy of Music, Lincoln Center's Out of Doors Festival, Fashion's Night Out at Osklen in Soho, the Brazil Foundation Gala, and at the Broward County Performing Arts Center in Fort Lauderdale, FL. Harlem Samba has been featured in the documentary film and Brazilian television program Beyond Ipanema: Brazilian Waves in Global Music, as well as the Brazilian television series Gaby Gringa. The Frederick Douglass Academy has made three study trips to Brazil, visiting Rio de Janeiro, Salvador da Bahia, and São Paulo. Students have participated in a cultural immersion program at a Rio de Janeiro high school, marched with the Nenê de Vila Matilde Samba School in the carnival parade in São Paulo, and taken classes with master Brazilian percussionists. We are extremely proud of our partnership with the Brooklyn Charter School an elementary school in Bedford-Stuyvesant, Brooklyn. Harlem Samba members have served as instructors, teaching third through fifth grade students how to play samba instruments. The combined groups have delivered two outstanding performances in Brooklyn. Samba is a term used to describe several forms of Afro-Brazilian music that share similar characteristics of rhythm, melody, and musical structure. Samba is one of the more widely known forms of Brazilian music internationally because of its association with carnival. Harlem Samba primarily plays the form played by the samba schools of the Rio de Janeiro carnival. Samba schools are large community based organization whose primary purpose is to perform in the carnival parade. The bateria, or percussion section of the samba school, can number up to three hundred percussionists. Harlem Samba primarily uses seven bateria instruments: caixa, surdo, repinique, tamborim, chocalho, cuíca, and agôgo. Each of these instruments has a different sound, technique, and rhythm that combine to form one percussive orchestra. Candombe is the national music of Uruguay. The music is played on three drums: the chico (smallest drum), repique (middle drum) and the piano (largest drum). Each is played with one stick and one bare hand. Played on the street by groups of up to sixty costumed drummers. Candombe is well known as the carnival music of the country's capital Montevideo. Candombe is also a very flexible rhythm, well suited for small groups of drummers creating a fusion of candombe with jazz, rock, or other forms of music. The Frederick Douglass Academy has welcomed master Uruguayan percussionist Daniel "Tatita" Márquez. Dana Monteiro, music teacher at FDA met Tatita in Montevideo in 2012, while traveling to Uruguay to learn Candombe. Mr. Monteiro was extremely fortunate to choose Márquez for his teacher in Montevideo, as Tatita travels to New York often to perform and record. In 2013, Tatita was in residency at FDA for six weeks teaching, performing, and recording with our students. We are excited to welcome Tatita back to the Frederick Douglass Academy in 2014.